Whether you want to see ancient Roman ruins uncovered in nearby Itálica in the Archaeological Museum, ponder some of Spain`s most important paintings in the Fine Arts Museum, or take an up-close look at those shiny and impossibly tight outfits donned by bullfighters in the Bullfighting Museum, satisfy your curiosity with a visit to a few of Seville`s many museums! Housed in the renovated Convento de la Merced, Seville`s magnificent Fine Arts Museum has occupied the building since 1839. The extensive complex of intertwining halls and beautiful courtyards from the 13th century former convent is now graced by priceless works of such greats as El Greco, Zurbarán, Velazquez, Valdés Leal and the great Sevillano painter Estebán Murillo. The fifteen spacious halls featuring pieces from the middle ages up through the 20th century have earned Seville`s Fine Arts Museum acclaim as Spain`s most important art gallery after the Prado in Madrid. 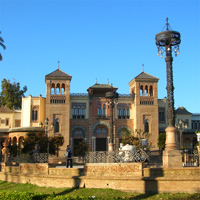 Constructed for the 1929 Ibero-American Exposition and facing the Provincial Archaeological Museum built for the same event, the stunning Mudejar-style building housing the Popular Arts and Customs Museum is tucked into the beautiful Parque de María Luisa. Traditional Andalucían music creates the atmosphere as you explore the lifestyles, musical instruments, dwellings, artisan trades, furniture, and clothing styles of traditional Andalucía. Perhaps the most impressive of the museum`s offerings is its varied collection of ceramics, which you can find on the bottom floor of the building. 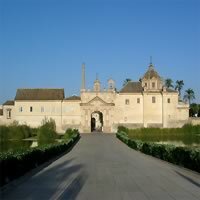 Located in La Cartuja, the Expo `92 site; it was founded in 1399, the monastery was a favorite lodging place of Columbus, and in 1839 the complex was turned into a porcelain factory, which explains the kilns that stand incongruously by the buildings. It is the home of the superb Andalucian Contemporary Art Center, which has a collection of local modern art and frequent temporary exhibitions. It pays homage to a wide range of contemporary Andalucían artists. Owning an immense collection of 20th century artwork including pieces from such maestros as Daniel Vásquez Díaz, Guillermo Pérez Villalta, and Antonio Rodríguez de Luna, the museum delights art buffs and art novices alike with its constantly rotating exhibitions of paintings, sculptures, tapestries and ceramics. One of the two museums situated in the lush Parque de María Luisa is the Provincial Archaeological Museum, an ode to Andalucía`s rich and diverse history. The charming Renaissance-style building, constructed as a pavilion for the 1929 Ibero-American Exposition, now houses an archaeological museum loaded with artifacts, mosaics, ruins, ceramics, sculptures and even sarcophagi dating back to between pre-history and the end of the Moorish era in Andalucía. 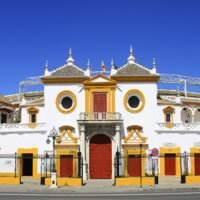 As one of Spain`s most important, famous and beautiful bullfighting venues, the grandiose Maestranza bullring pays homage to the controversial sport and its history through the memorabilia housed in its Museo Taurino. The museum features old posters, photographs, paintings, mounted bull heads, scarlet-red capes, and of course the spectacular trajes de luces that the bullfighters wear. Seville`s futuristic El Pabellón de la Navegación may have been overshadowed by the Metropol Parasol but this modern museum and exhibition space, which opened in January 2012, is just as thought-provoking. Its permanent collection is split into four parts – shipboard life, mariners, historical views of Seville and navigation.